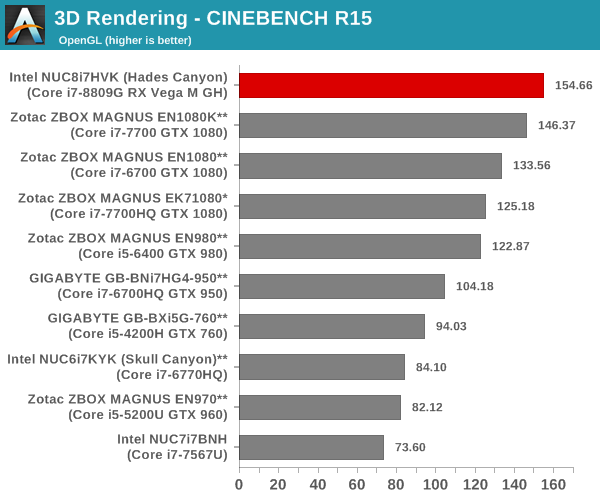 We have moved on from R11.5 to R15 for 3D rendering evaluation. 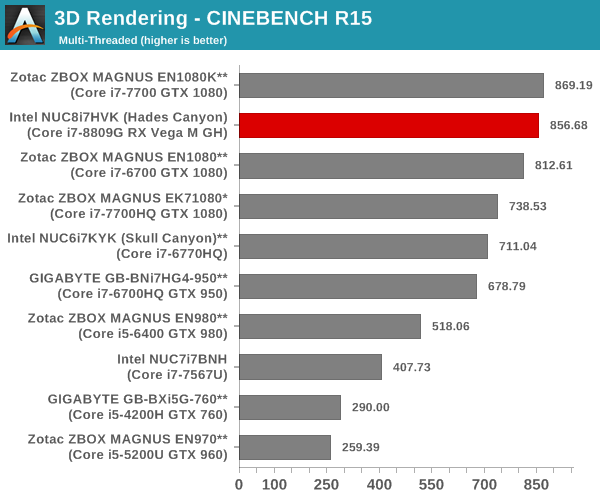 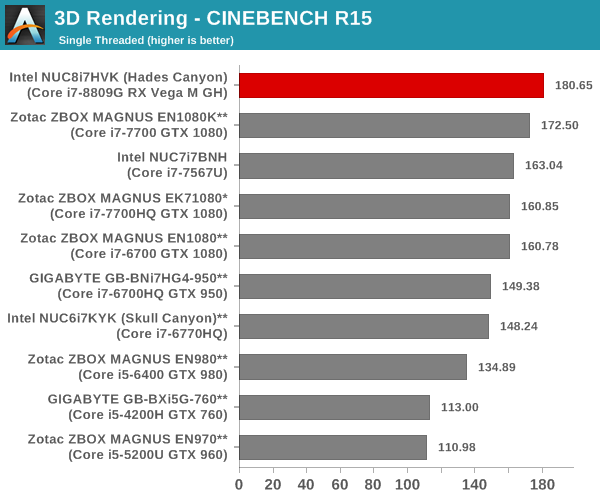 CINEBENCH R15 provides three benchmark modes - OpenGL, single threaded and multi-threaded. 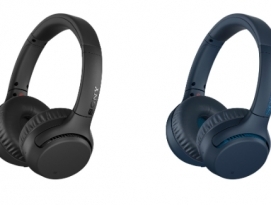 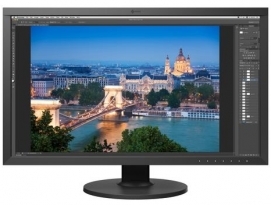 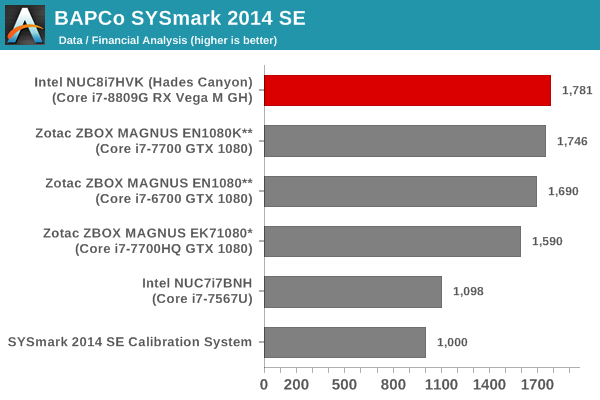 Evaluation of select PCs in all three modes provided us the following results. 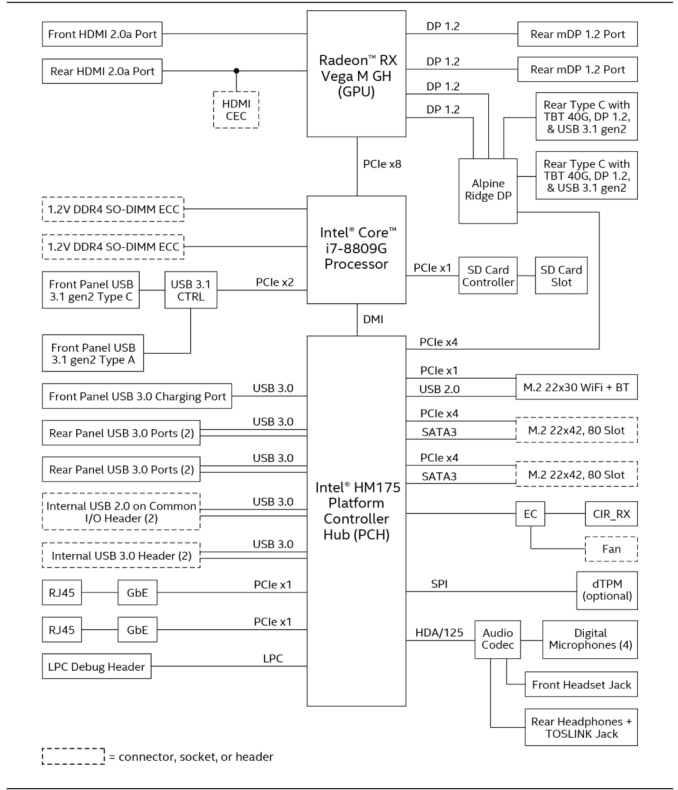 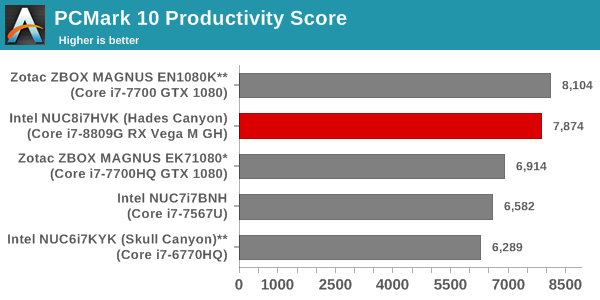 Here, we see the benefits of running the CPU die with a 65W TDP. 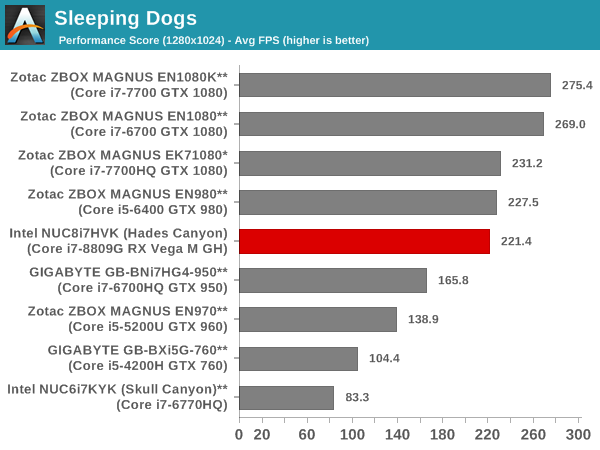 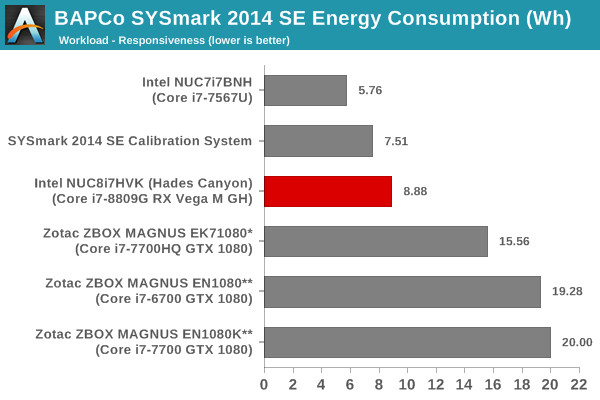 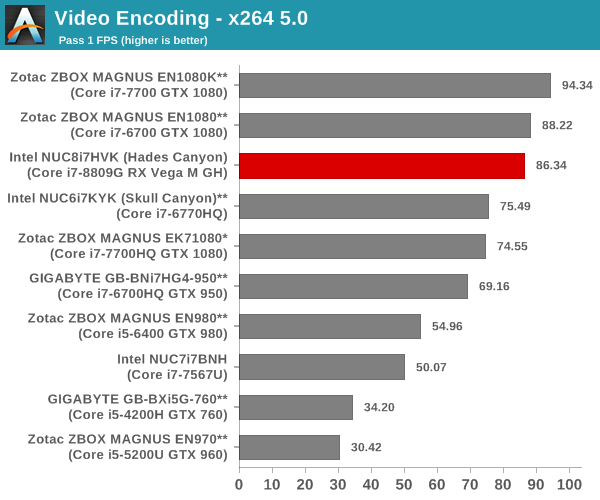 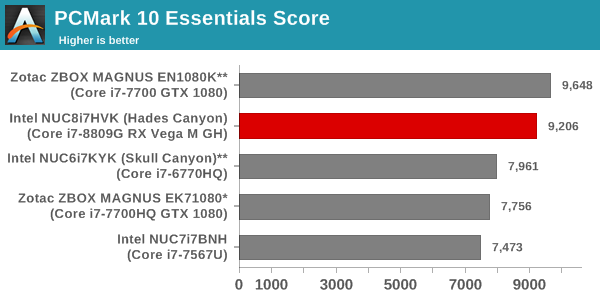 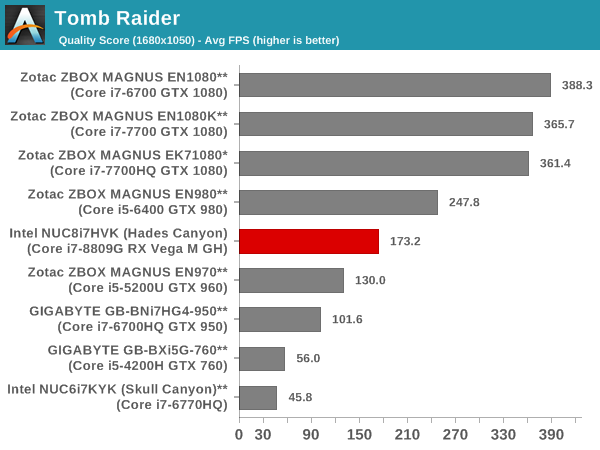 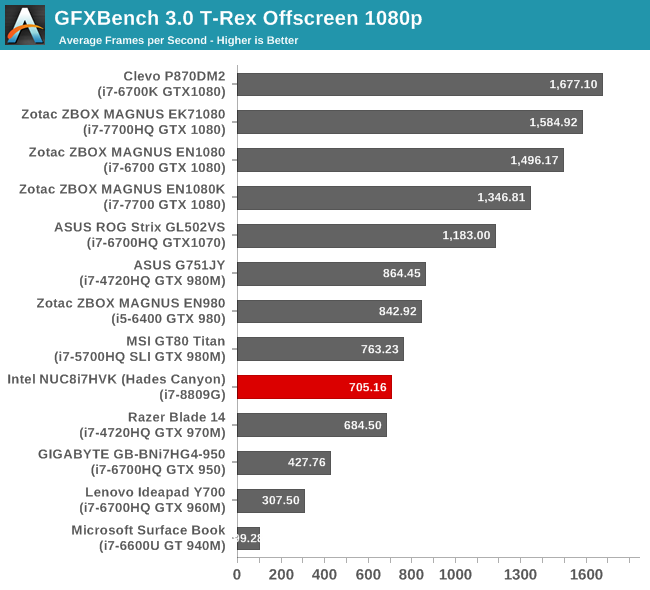 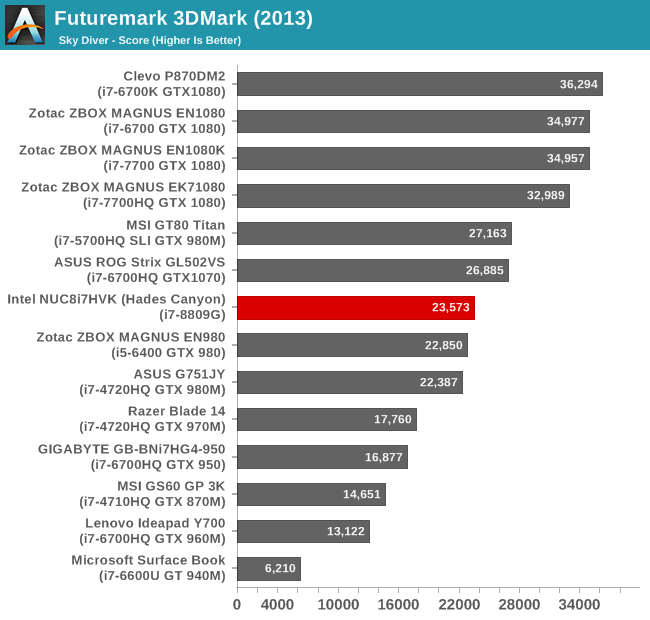 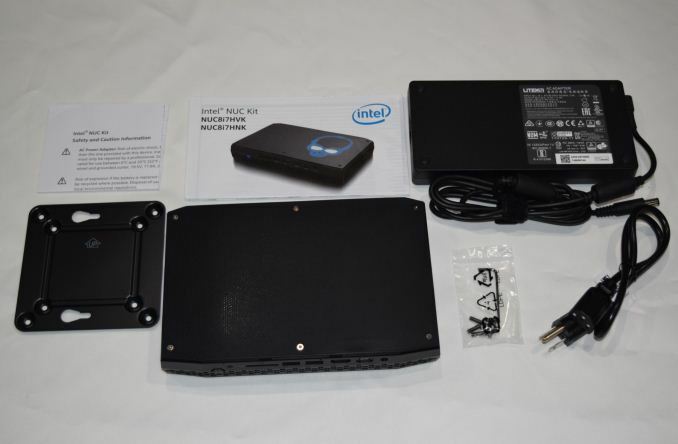 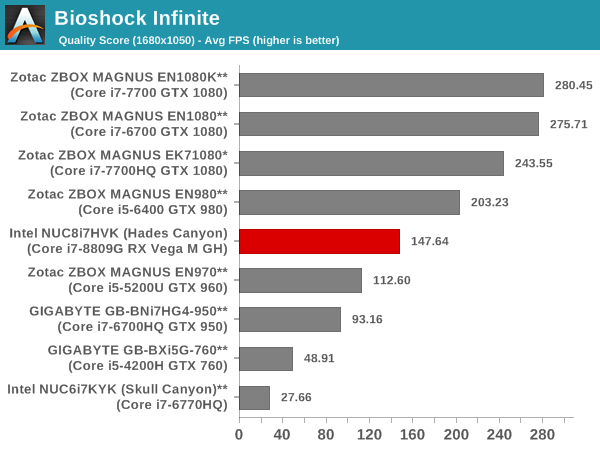 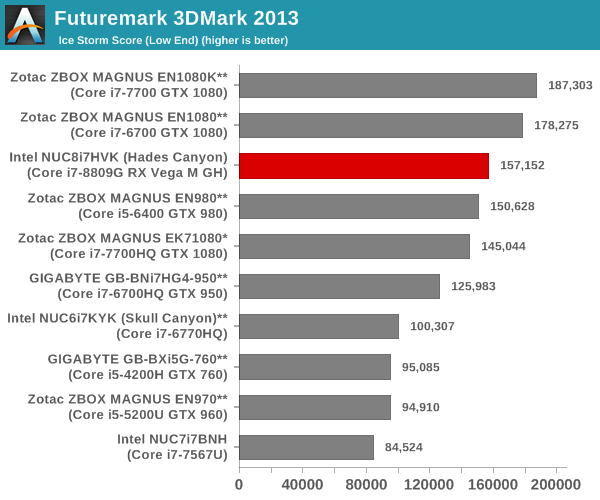 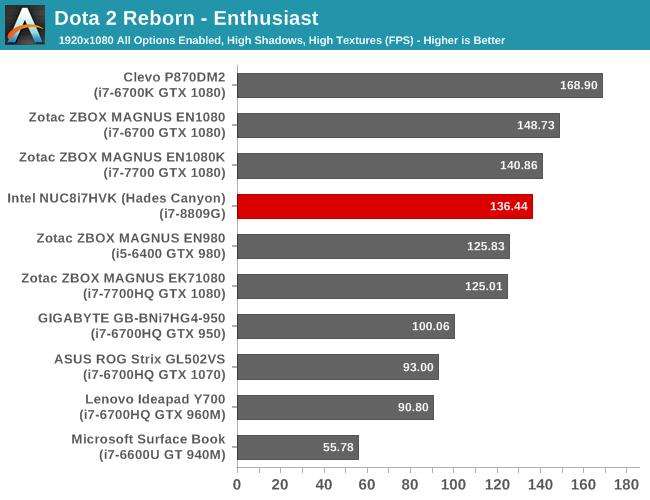 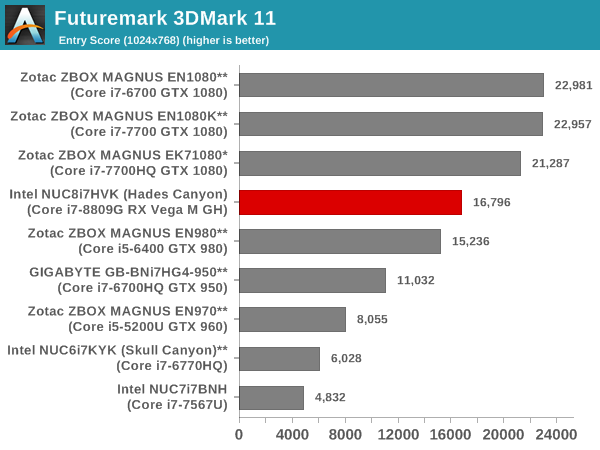 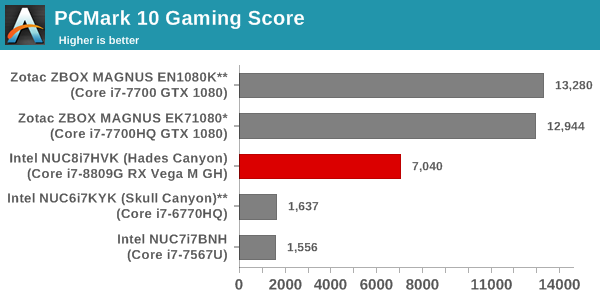 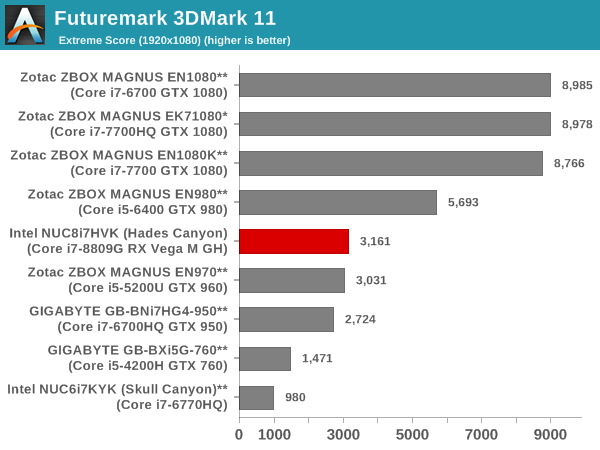 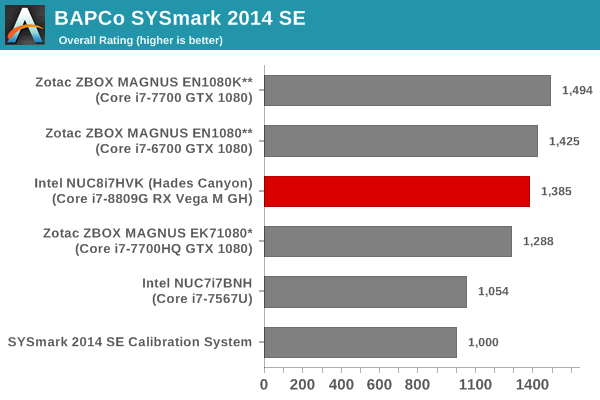 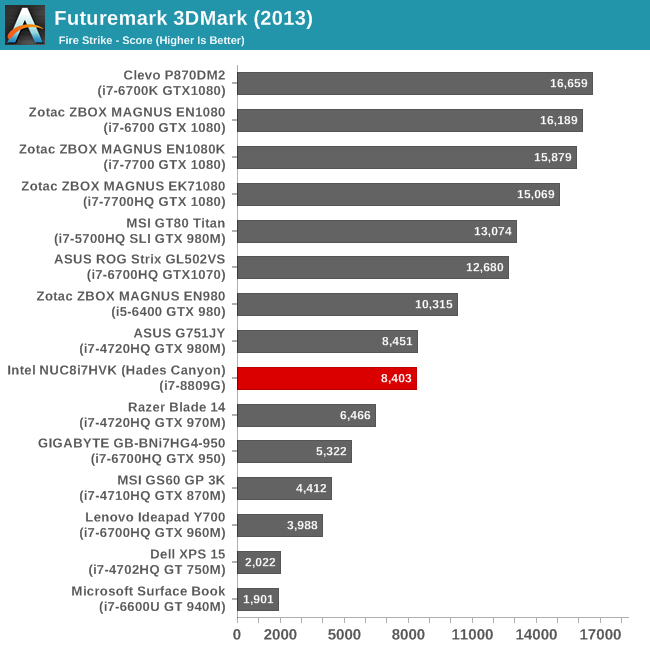 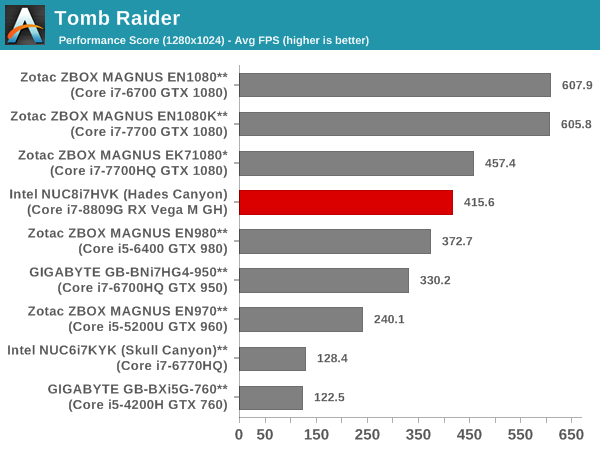 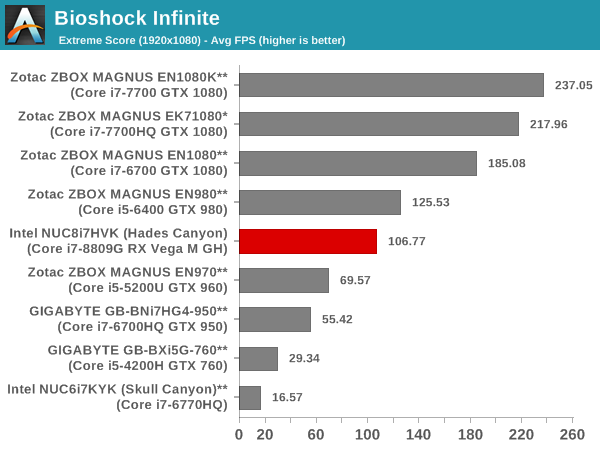 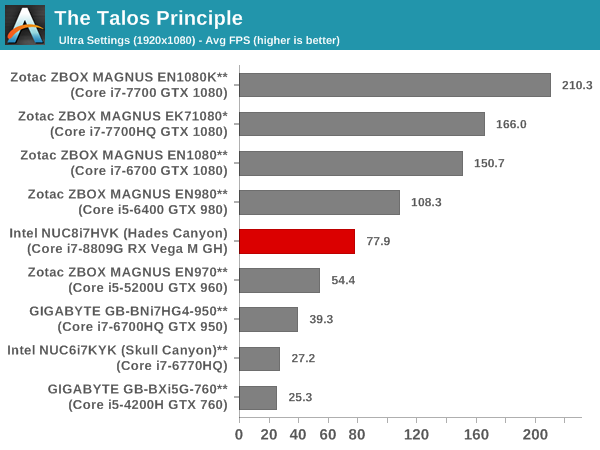 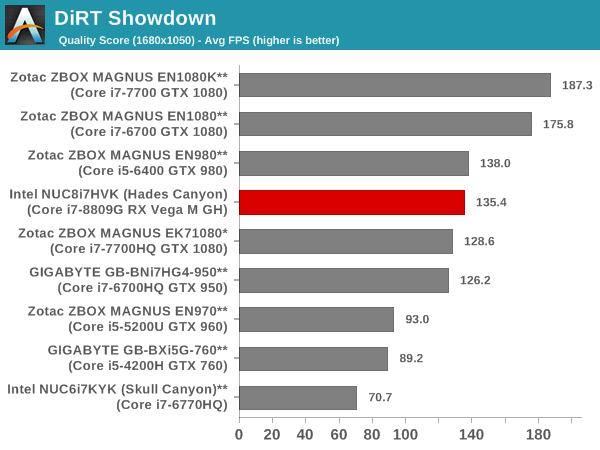 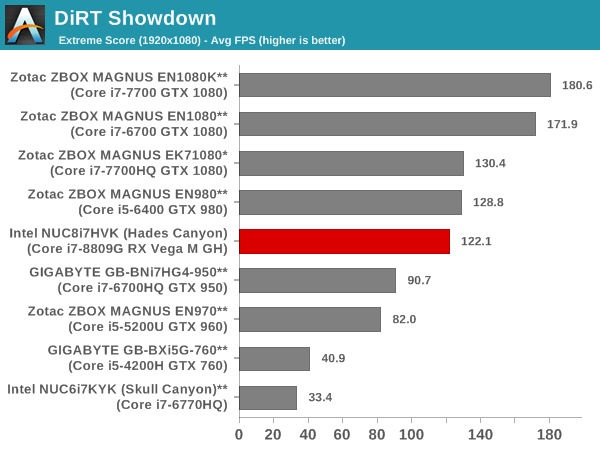 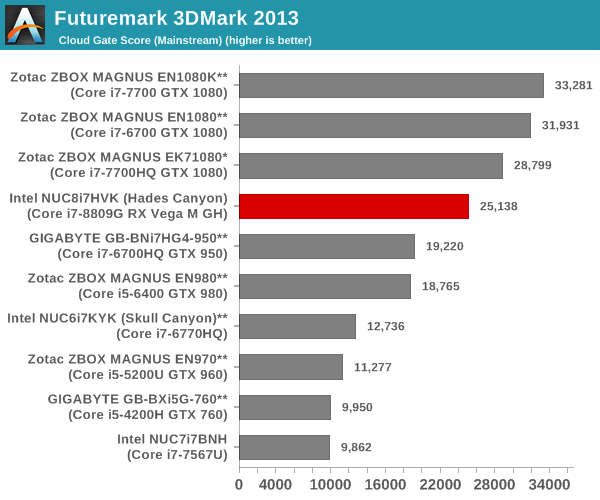 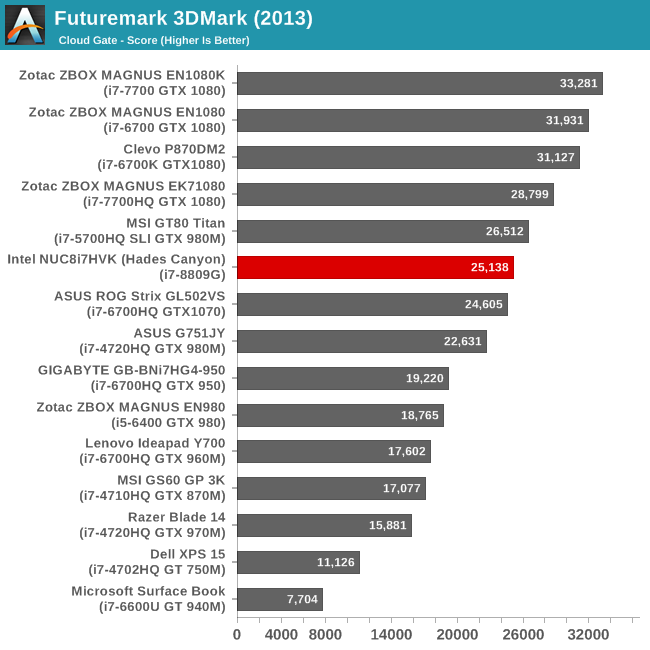 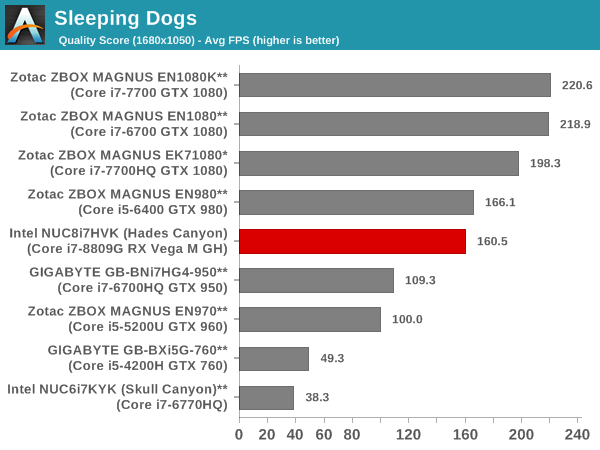 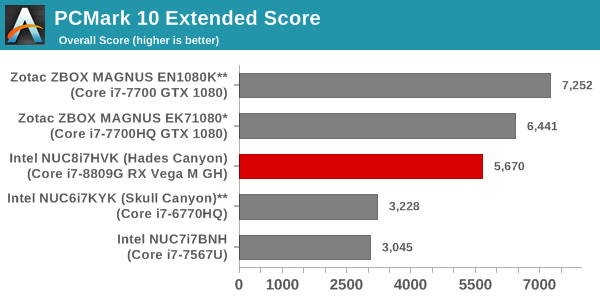 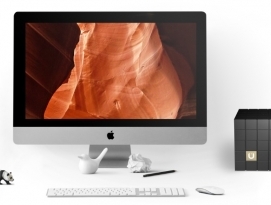 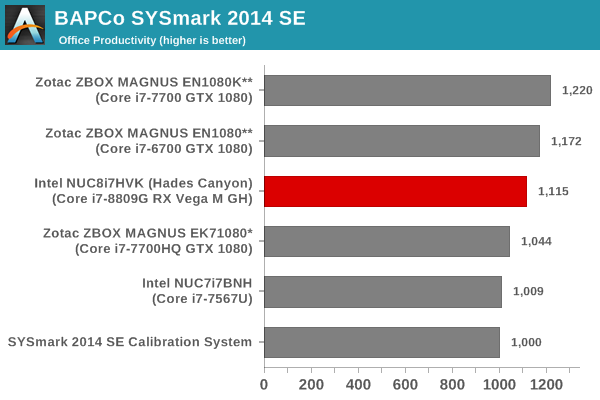 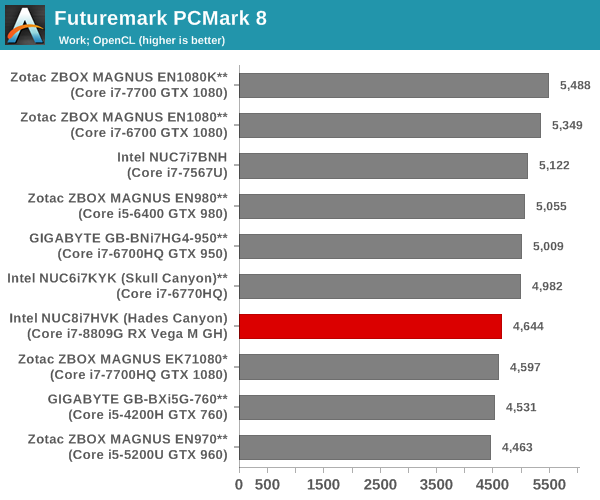 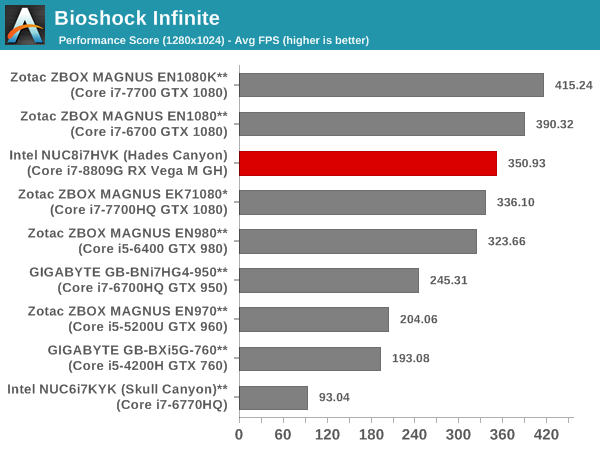 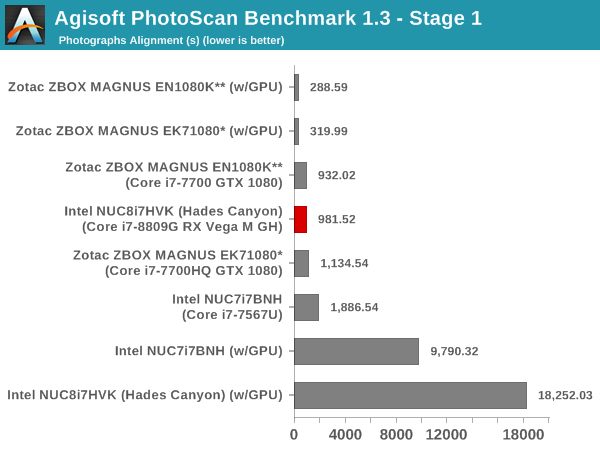 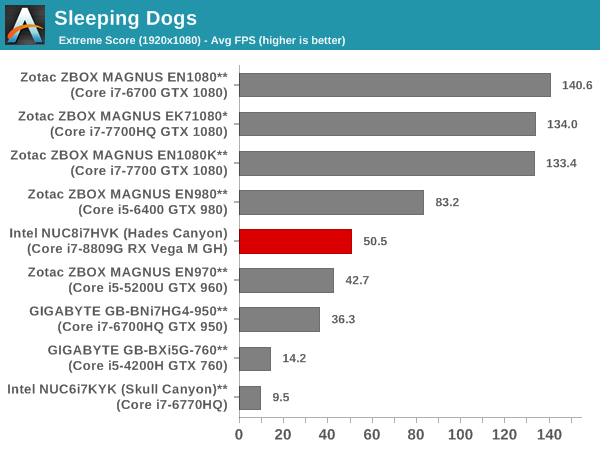 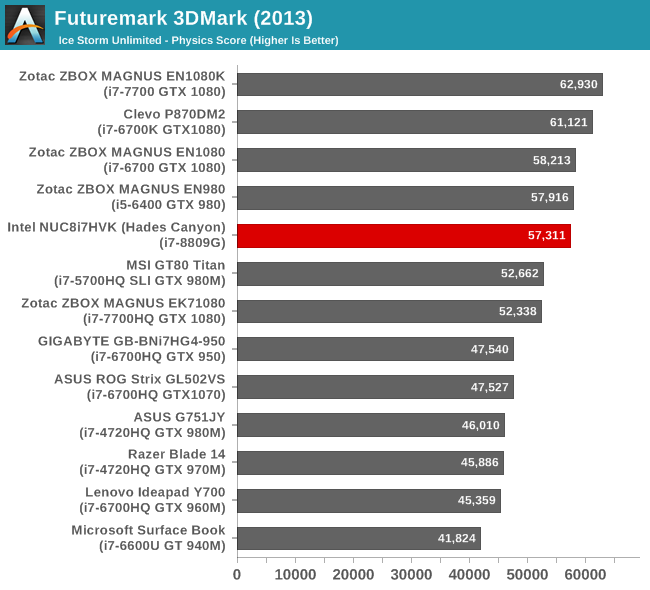 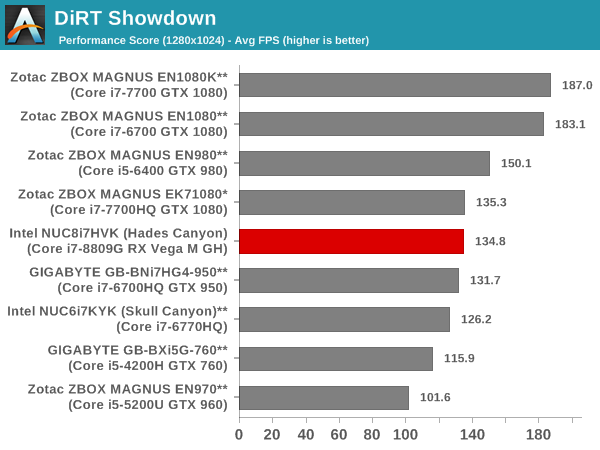 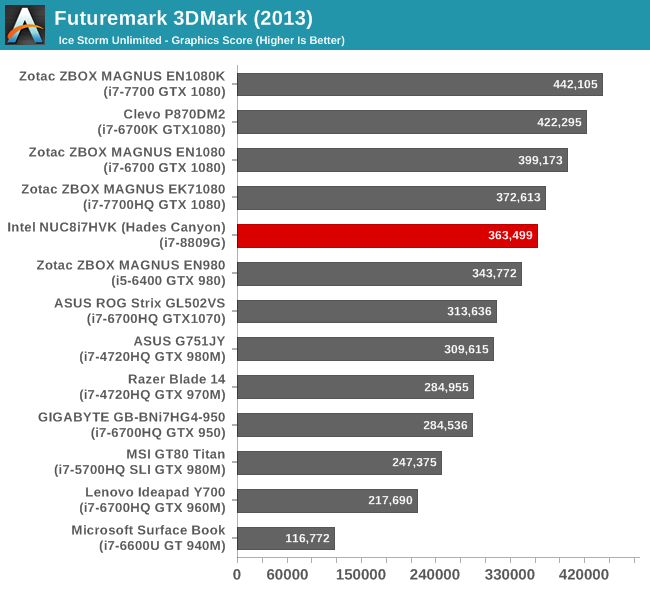 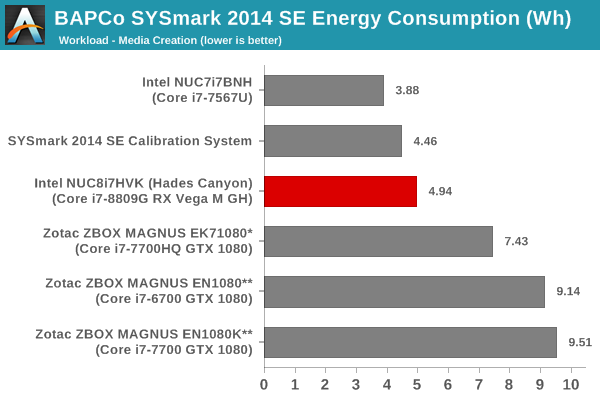 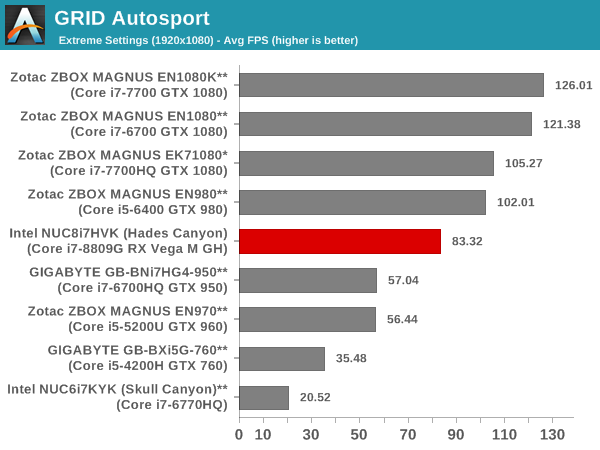 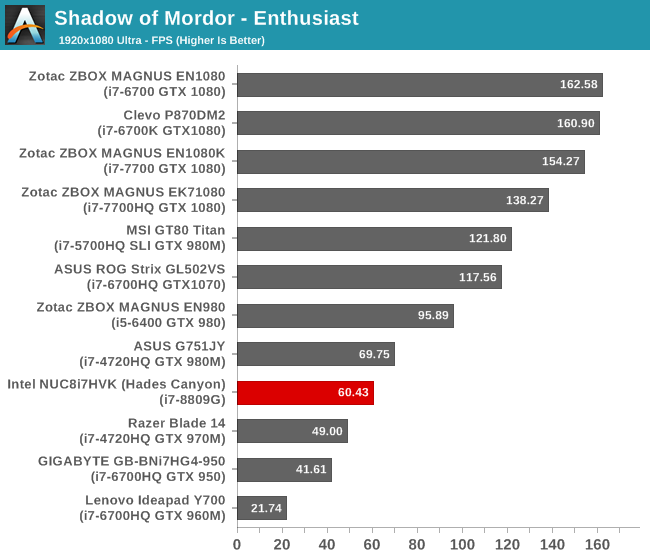 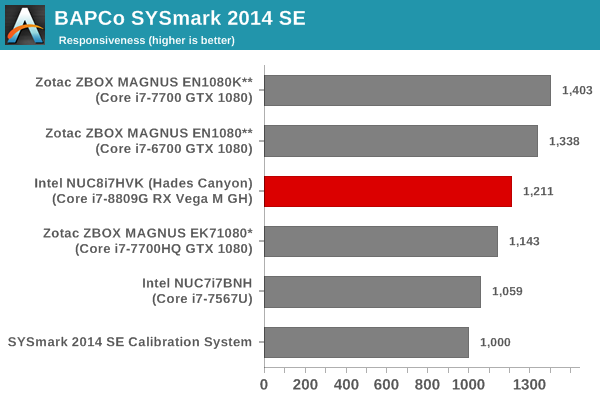 The scores match or beat the results from the Core i7-7700 in the ZBOX MAGNUS EN1080K. 7-Zip is a very effective and efficient compression program, often beating out OpenCL accelerated commercial programs in benchmarks even while using just the CPU power. 7-Zip has a benchmarking program that provides tons of details regarding the underlying CPU's efficiency. 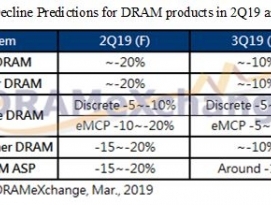 In this subsection, we are interested in the compression and decompression MIPS ratings when utilizing all the available threads. 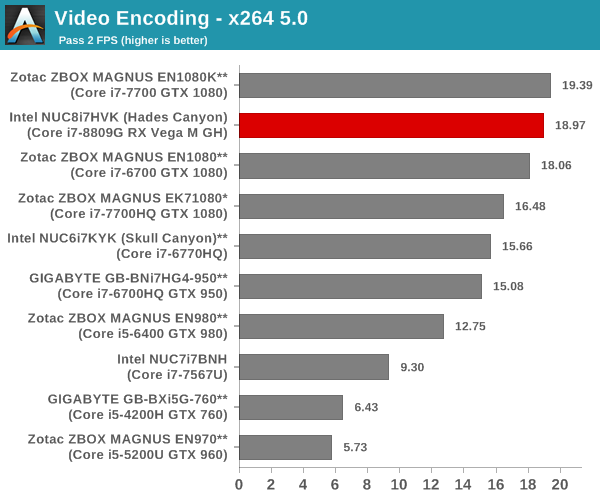 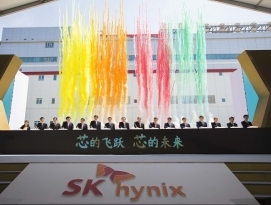 The performance order is similar to the one encountered in the x264 benchmark. 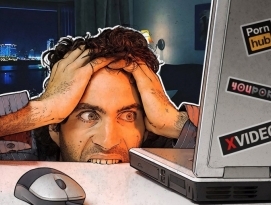 As businesses (and even home consumers) become more security conscious, the importance of encryption can't be overstated. 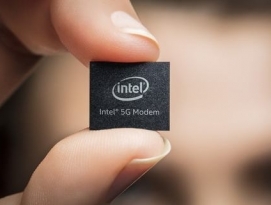 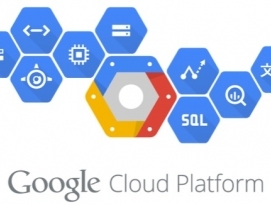 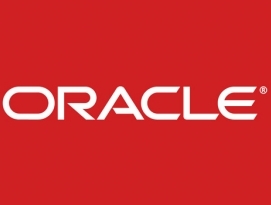 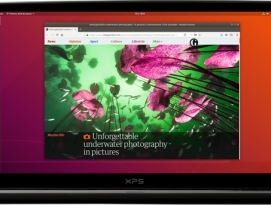 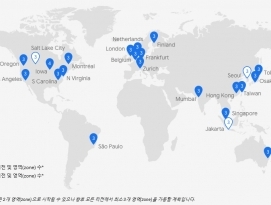 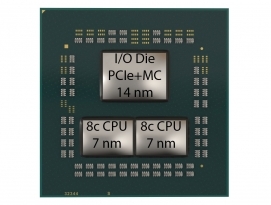 CPUs supporting the AES-NI instruction for accelerating the encryption and decryption processes have become more widespread over the last few years. 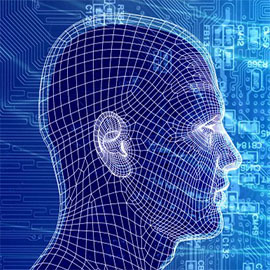 TrueCrypt, a popular open-source disk encryption program can take advantage of the AES-NI capabilities. 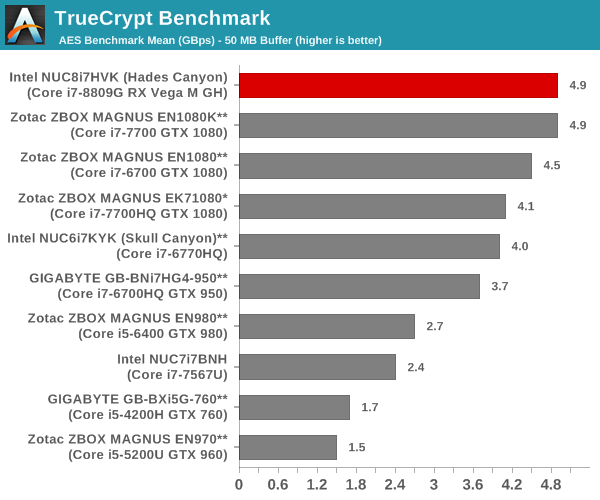 The TrueCrypt internal benchmark provides some interesting cryptography-related numbers to ponder. 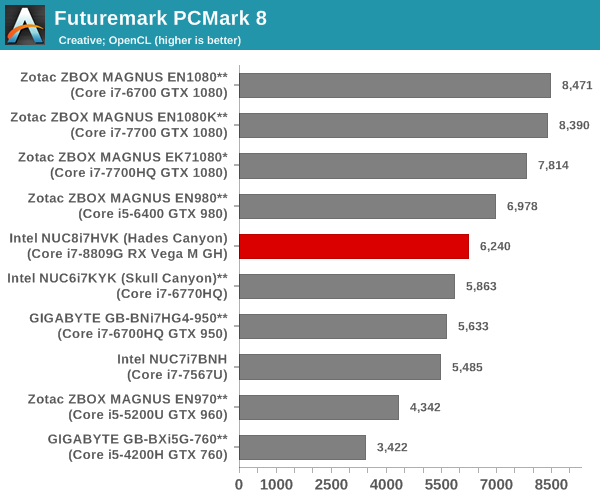 In the graph below, we can get an idea of how fast a TrueCrypt volume would behave in the Intel NUC8i7HVK (Hades Canyon) and how it would compare with other select PCs. 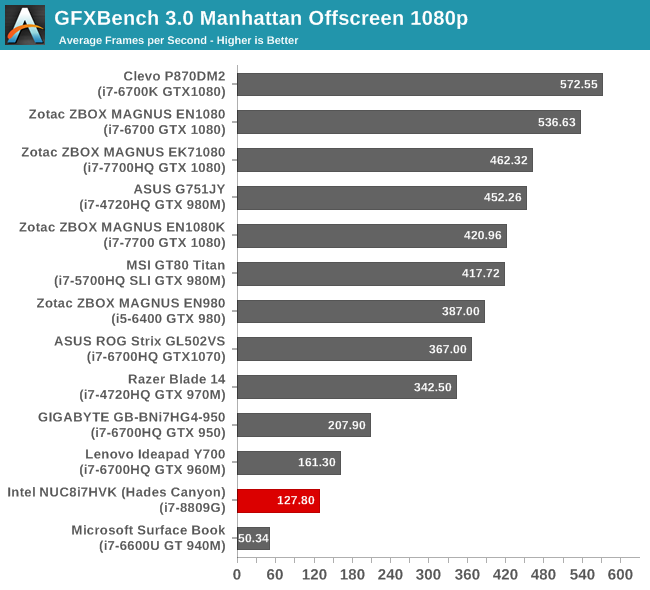 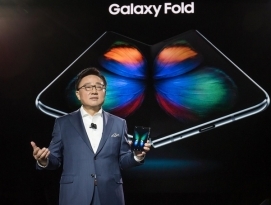 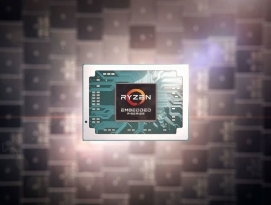 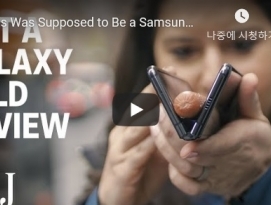 This is a purely CPU feature / clock speed based test. 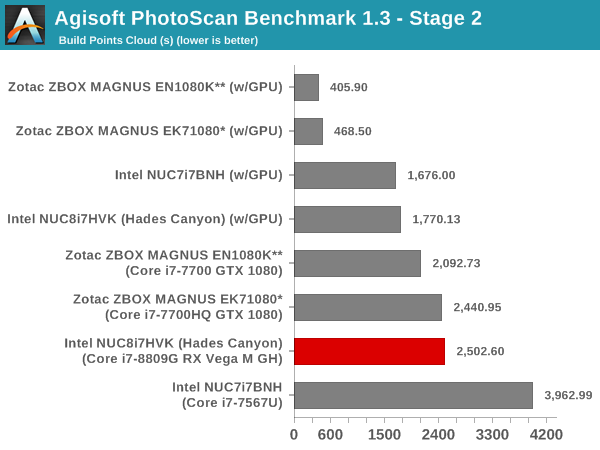 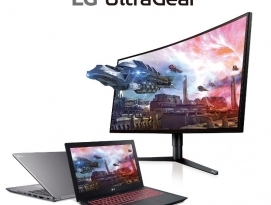 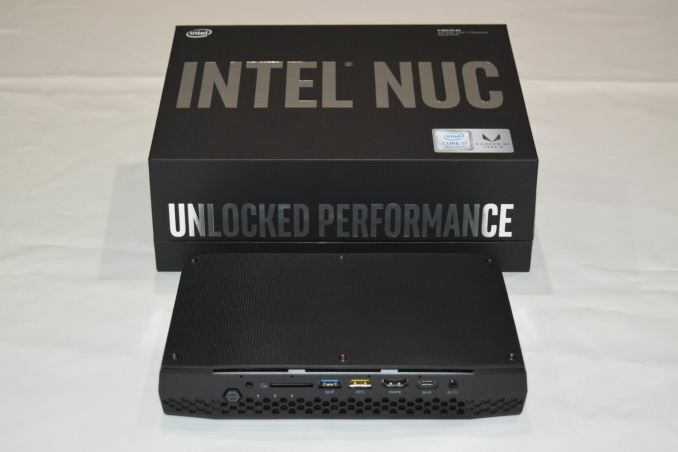 The GPU-enabled numbers for Stage 1 and 2 below are with the use of the Intel HD Graphics 630, since our benchmark version only supports use of the first enumerated GPU. 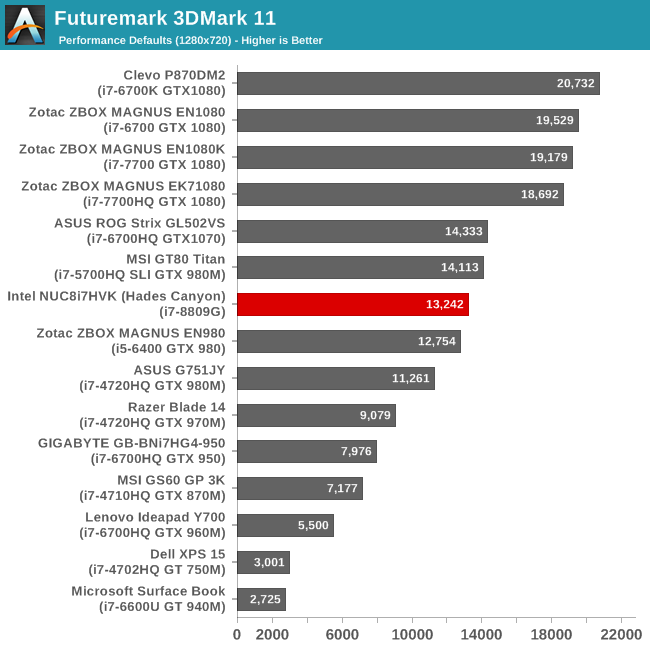 Unfortunately, when we tried to disable the integrated GPU and use only the discrete GPU after changing the BIOS setting, the benchmark consistently crashed while starting the first stage itself. Wrapping up our application benchmark numbers is the new Dolphin Emulator (v5) benchmark mode results. 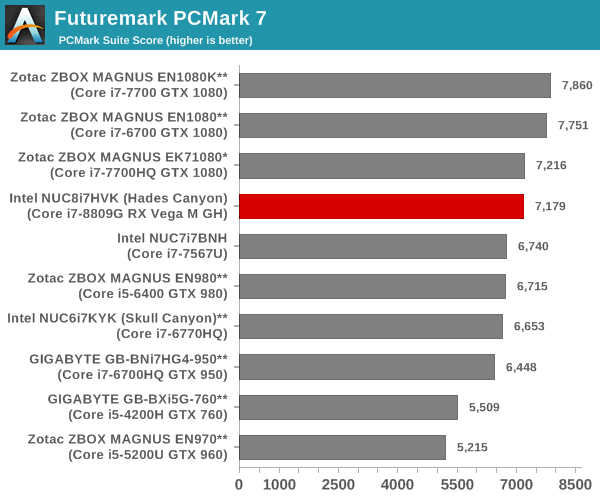 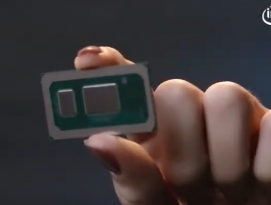 This is again a test of the CPU capabilities, and the Core i7-8809G slots inbetween the 45W TDP Core i7-7700HQ and the 65W Core i7-7700. 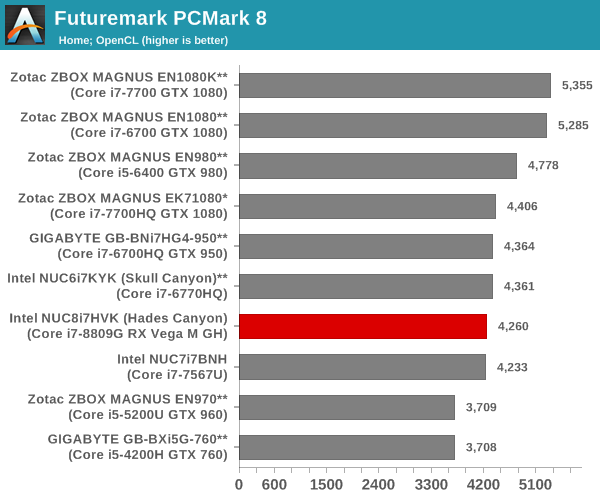 인텔 카비레이크-G Core i7-8809G 프로세서의 CPU는 i7-7700HQ 급 성능에 지포스GTX 960~980급 사이에 위치하는 GPU 성능으로 엄청난 CPU + GPU 성능을 나타내고 있다. 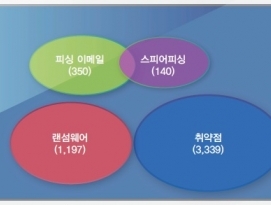 와 내장으로 엄청난 성능을 실현해버리네요..!